I'll be pulling out an oldie-but-goodie to review I Love to See the Temple (does anyone really need to teach this entire song? We maybe need to brush up on the 2nd verse). You can find my fun, yet outdated lesson plan HERE with terribly outdated links that don't work anymore so I'd recommend all the information below instead! Looks like you can also just upload it and print as a 16x20 or 20x30 lustre photo too. The instructions above are the hard way ;). Then I just printed the Angel Moroni on white card stock on my printer, cut it out and laminated. I kept with one Moroni so there will be no competition (except against themselves to see if they can get it in the right spot) but play it how you like! If you are limited on time or resources to have this printed, you have several options: freehand your picture on a poster board like I did on my old post above, or even draw the temple on the chalkboard with chalk. Any picture of the temple hung on the chalkboard would suffice as well. Make it as simple as you like! 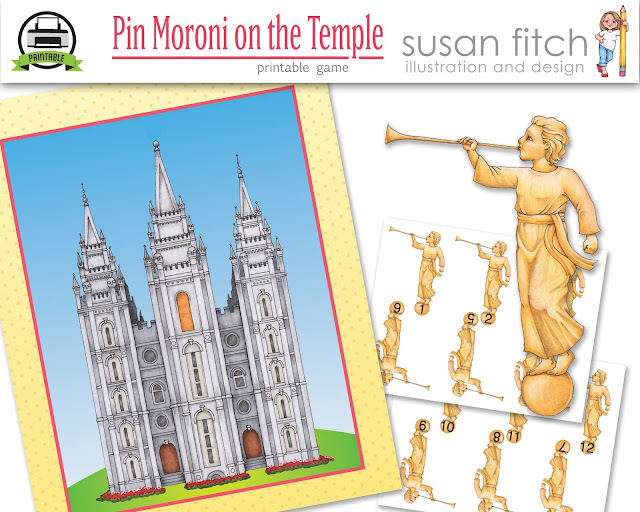 The kids could even draw and cut out their own Moroni to pin on! Wouldn't they love that?! You can download all these questions HERE. As the child is pinning on Moroni (feel free to blindfold and gently spin beforehand), the primary will sing the song. The primary will sing louder as the child is going in the right direction, and softer if they are going in the wrong direction (if I find this doesn't work, I will just omit it). I'll also make sure to tell the kids that they need to listen to the words as they sing so they can answer the questions correctly to get a turn ;). And only great singers will get a chance to answer a question. I'll obviously be less stringent with Junior primary than I will be with Senior primary. UPDATE: the loudly/softly didn't work very well for me so I ended up omitting it. Also, for Jr. I simply picked the best singers (eventually everyone got a turn :), to walk from the back of the room to the temple with Moroni in their hands and pin him on as the primary sang. They LOVED it, were so reverent and sang their hearts out for a turn! In between turns, we'd go over some of the questions together as a group. Hopefully you will be able to review the song over and over again as each child gets a turn to pin Moroni on the temple!